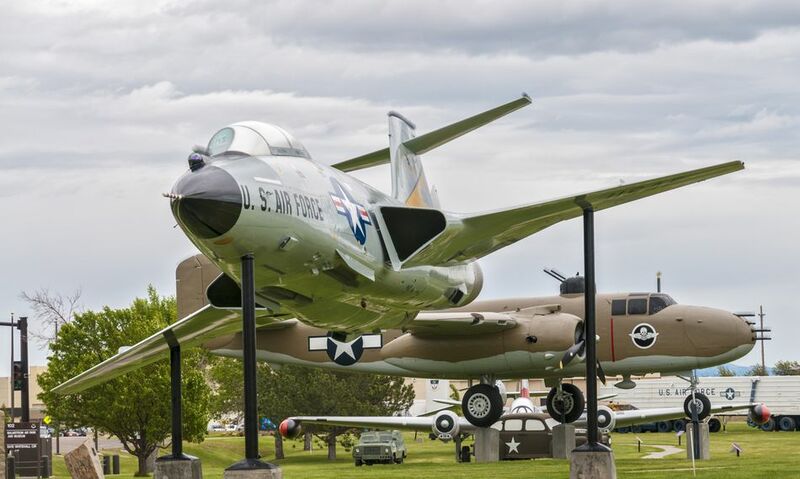 Malmstrom Air Force Base is the United States Air Force Base in Cascade County, Montana, located on the east side of Great Falls. Malmstrom AFB is one of three US Air Force Bases that maintains and operates the Minuteman III intercontinental ballistic missile. The 341st Missile Wing reports directly to Twentieth Air Force at F.E. Warren Air Force Base, Wyoming. It is part of Air Force Space Command, headquartered at Peterson Air Force Base, Colorado. Malmstrom AFB was named in honor of World War II POW Colonel Einar Axel Malmstrom. Colonel Malmstrom shot down on his 58th combat fighter mission in World War II, became the US commander of Luftwaffe Stalag Luft 1 South Compound, at Barth, Germany. After his release and return to active Air Force service, he died in the crash of a T-33 Shooting Star trainer on 21 August 1954 near Great Falls Air Force Base. In the short period of his tenure as vice wing commander, Colonel Malmstrom endeared himself to the local community. The mission of the 341st Missile Wing is to defend America with combat-ready Airmen and nuclear forces. Currently, Malmstrom is home to 150 Minuteman III ICBMs, 50 in each of 3 squadrons, the 10th, the 12th, and the 490th. A detailed life extension program is underway to keep the missiles safe, secure, and reliable well into the 21st Century. Malmstrom AFB is located adjacent to and East of the city of Great Falls in North Central Montana. The city is approachable from the South, via Interstate 15 from the cities of Butte and Helena. From the west on Highway 200 from the city of Missoula. From the east on Highway 87 from the city of Lewistown. From the northeast on Highway 87 from the city of Havre, and from the north on Interstate 15 from the city of Shelby. The Great Falls International Airport serves the Great Falls area and is approximately 9 miles west of MAFB. Taxis or rental cars are readily available at the airport but it is suggested that you have your sponsor transport you to the base. There are no military shuttles from the airport to the base. There is a commercial mass transit bus service in Great Falls but has limited schedules. From the airport take Interstate 15N to the 10 St South Exit. Head east on 10 St South to the east side of Great Falls and take 57st N about 1 mile to the MAFB gate. The 341st Missile Wing, headquartered at Malmstrom Air Force Base, is the host unit and one of three U.S. Air Force Bases that maintains and operates the Minuteman III intercontinental ballistic missile. Malmstrom is the youngest community in Montana and the youngest workforce in the Air Force. 53 percent of officers are Lieutenants and 55% of enlisted are Airmen, Staff Sergeant. Of our more than 4,000 employees, 88% are military members and 12% are civilian employees. Temporary accommodations on the base are limited. PCS-out has first priority in the Temporary Lodging Facility (TLF). Reservations for PCS-in may be made for two weeks with possible extensions. Pets are not allowed in the TLF. For reservations call TLF office, 7028 4th Ave N, Malmstrom AFB MT 59402-6835 or telephone: Commercial (406) 727-8600 or DSN 632-3394. PCSing member. Temporary accommodations on the base are limited. PCS-out has first priority in the Temporary Lodging Facility (TLF). Reservations for PCS-in may be made for two weeks with possible extensions. For reservations, please direct your correspondence to TLF office, (406) 727-8600 or DSN 632-3394. All military members residing in the Temporary Living Facility are authorized to remain there for up to 30 days; however, only 10 days will be reimbursed. Single members should check in with lodging for a key to a hospitality suite while they are awaiting their dorm room. Eligible military personnel may submit an advance application for military family housing at any time after they have received PCS orders. The application will be submitted on DD Form 1746, "Application for Assignment to Housing", submitted through the Housing Office at the losing installation or the officer who performs the billeting function if there is no housing office at the installation. One copy of PCS orders must accompany the advance application. The effective date of an advanced application for family housing is the date of departure from last duty station or date ordered to active duty. If you apply within 30 days after arrival at the new duty station, the application date will be the date of departure from last duty station. If you apply more than 30 days after arrival, the applicable effective date will be considered a walk in date unless the member is returning from a remote assignment that qualifies for a special effective date. Applicants who wish to specify a particular type of housing may do so upon reporting to the housing office. Peacekeeper units are available to personnel E-3 and below. Units available for E-4 through E-6 include 2, 3, and 4 bedroom Titan & Peacekeeper; and 2, 3, and 4 bedrooms newly constructed units in Matador Manor and Minuteman Village. Senior NCOs in pay grades E-7 through E-9 are eligible for 3 and 4 bedroom Peacekeeper, along with 3 and 4 bedroom units in Matador Manor and Minuteman Village. Officer housing consists of 3 and 4 bedroom units in Peacekeeper and Titan Village. All quarters are equipped with range, refrigerator, dishwasher, and garbage disposal. Pitbull, pitbull mix, rottweiler, and rottweiler mix breeds are not permitted in base housing. You are required to visit the Housing Office before entering into any rental or sales agreement. There you will be briefed on valuable information concerning rentals and/or sales in the local area, information on utilities and restricted areas. If you have any questions call (406)731-3056 or DSN 632-3056. Unaccompanied enlisted members in the pay grades of E-1 through E-4 are normally required to reside in dormitories and should check in with the Central Dorm Management Office upon arrival. New dorms have been completed to provide a one plus one atmosphere. Malmstrom does not have bachelor officers quarters. MAFB Housing does have approximately 25 housing units available for Exceptional Family Member/Handicap individuals. Please contact the Housing office on MAFB to provide them with specific needs that they may address. The Child Development Center provides center-based care for children 6 weeks to 5 years of age. The CDC provides care to children of active duty military and civilian personnel families in a quality developmental learning environment. They are licensed by the Department of Defense and accredited by the National Association for the Education of Young Children. The center has a capacity of 162 full-time spaces. Family Child Care programs consist of in-home care provided by licensed and affiliated providers. Trained FCC providers are available to provide daily, night, weekend, and unusual hours of care for children 2 weeks to 12 years of age. Providers are required to complete an extensive training program and are constantly monitored for quality to maintain licensing. Family Child Care is a realistic alternative to a center-based care program. FCC's provide home-like, individualized care. Special programs are offered for Extended Duty Care, Missile Care, Child Care for PCS, Child Care for Volunteers - contact the FCC coordinator at 406-731-2116. The Great Falls school system has 15 elementary schools, 2 middle schools, 2 high schools, and 1 private Catholic high school. There is 1 alternative high school, 1 College of Technology, 6 private elementary schools, 1 private university, 4 public universities, and 1 private college in town. The Great Falls Public School System requires proof of birth date and current shot records for student enrollment. It is a federal rule that only 10 days a semester are allowed for absences from high school; if a student takes more than 10 days, he or she is at risk of losing credit (exceptions are made on a case by case basis). Extended absences of younger children could possibly result in grade repetition. If you bring your child's school records with you, they must be in a sealed envelope from the school previously attended; otherwise, the school system here will send for them. Be sure to bring the address and phone number of the school your child last attended. All elementary school children residing on base will register with Loy Elementary - when full students will be assigned to other nearby elementary schools (Loy is right outside the gate), all middle school children residing on base will attend North Middle School, and all high school children residing on base will attend Charles M. Russell High School. If you are considering private/home schools contact the Family Support Center for a point of contact regarding homeschooling or for more information. There are no schools located on the installation. All children attend public or private schools off the installation. A good education will expand a child's options for the future. The base Education Center has information regarding programs offered through the university system & various colleges on the installation. The 341st Medical Group is located at 7300 N. Perimeter Rd. The number to access the clinic is 406-731-4MED or 1-866-731-4633, whether during or after duty hours. The clinic offers family practice, pediatrics, flight/missile medicine, gynecology, optometry, mental health, physical therapy, and dental services. It also has radiology, including MRI, and laboratory services. There are no emergency room or inpatient services. The clinic is open 7:30 a.m.-4:30 p.m, Monday through Friday. It closes on the fourth Thursday of each month for Readiness Training. It is also closed on all federal holidays and 341st Missile Wing and Air Force Global Strike Command Family Days. Only Active Duty personnel, TRICARE Prime, and TRICARE Plus enrollees can seek medical care. However, pharmacy, lab, radiology, and physical therapy are available to all eligible beneficiaries. Dental care services are available to active duty military only. However, emergency dental care is available to all. If specialty care is necessary, you will be referred to the Great Falls medical community. However, some specialties are not available through the local community. If you or a family member requires one of those specialties, you may be referred to other cities in Montana or other states. There is a TRICARE benefit that may be able to assist with travel costs. Information on the travel benefit is available through Tricare Operations and Patient Administration (TOPA). If you are experiencing a true medical emergency, you should call 911 or go directly to the emergency room, located on the East Campus of Benefit Healthcare. They should notify their PCM of the ER visit or admission the next duty day, if possible. For urgent care needs after normal duty hours, you must call your PCM at (406) 731-4MED, if out of state call 1-866-731-4633.